So today is launch day of my new Reston VA home search website. I hope you will find it a useful tool as you research all that Reston has to offer. I will be doing a series of articles on Reston neighborhoods and well as news and events. We are so fortunate and have so much to take advantage of right here in Reston. 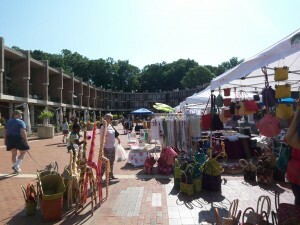 Today I'm taking a few minutes to talk about the Reston Farmer's & Crafter's Markets, held down on Lake Anne every Saturday morning. A great Saturday morning activity this Farmers Market was voted number 1 by Northern VA Magazine in 2009. In addition to great fresh produce, dairy and meats you will find amazing handcrafted jewelery and other beautiful items from around the world. There's a balloon twister and face painter for the kids and at least two and sometimes 3 places where you can stop and enjoy some music. The Market is open from 8:00 - 1:30 (get there before 12:00 for the Farmers!) every Saturday from May - November. If you've had a great time at the market on Saturday I hope you'll leave a comment. Also since this blog is all about Reston neighborhoods I hope you'll contact me if there's something you think I should know about.